We've learned that on July 26, Akram Raslan and other prisoners of conscience including journalists, artists, singers and other intellectuals were secretly put on trial with no witnesses, no defense attorneys, no appeal, and no hope for justice. From unconfirmed and sketchy reports we learned that they were all condemned to life imprisonment. Somehow, along the way to prison young 28-year-old Akram Raslan (and possibly others) was peeled off, taken out and executed. 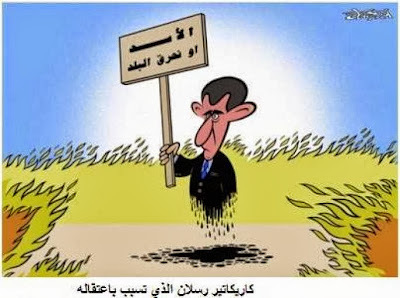 He is reported to be in a mass grave somewhere near Damascus. Our reliable but for obvious reasons anonymous sources further allege that the murder of Akram and other condemned prisoners was carried out by Mohammad Nassif Kheir Bek, currently the Deputy Vice President for Security Affairs in Syria. He has already been sanctioned by the European Union for the use of violence against protesters and the Syrian civil war. Akram Raslan was the winner of the Cartoonists Rights Network International, Award for Courage in Editorial Cartooning for 2013. It's a tale of two worlds colliding: social media and a war-torn country ruled by a dictator. 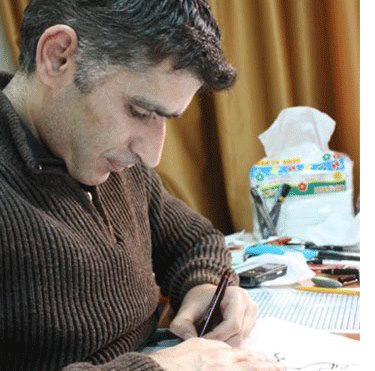 Syrian political cartoonist Akram Raslan was arrested and detained in Hama and thrown into a Syrian security prison in October, 2012. Since then, no one on the outside has heard from him - not family, friends or colleagues. "He is reported to be in a mass grave somewhere near Damascus," the report read. "Our reliable, but for obvious reasons anonymous, sources further allege that the murder of Akram [Raslan] and other condemned prisoners was carried out by Mohammad Nassif Kheir Bek, currently the Deputy Vice President for Security Affairs in Syria." 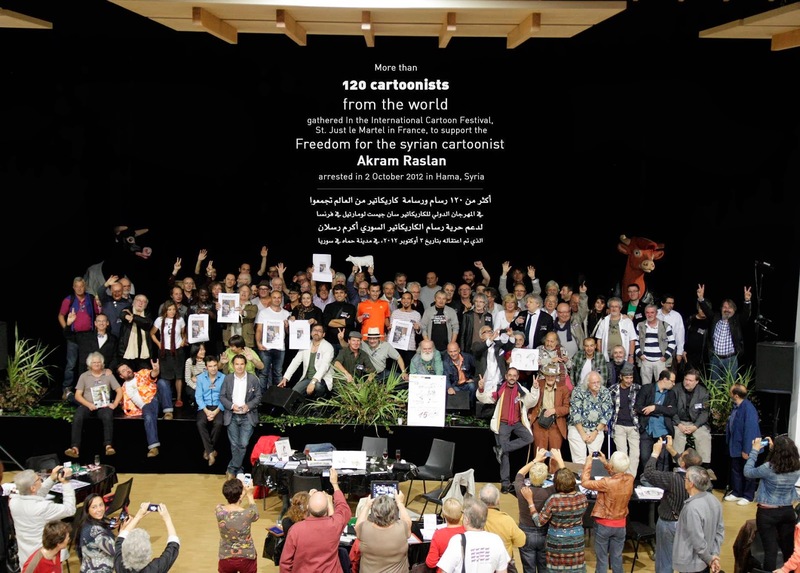 Cartoonists' Rights Network International, which authored the report, has been involved in the case of Akram Raslan since he was detained in 2012. Akram Raslan was the recipient of the organization's Award for Courage in Editorial Cartooning for 2013. The human rights group has good sources in and outside Syria. But there's one problem. On Facebook and Twitter, people are saying that Akram Raslan is still alive. And Raslan's own family doesn't believe the reports that Akram is dead. Following the initial report by Cartoon Rights Network International, Michael Cavna of the blog Comic Riffs spoke to CRNI's director Robert Russell and afterward added some clarification. "CRNI’s report of Raslan’s death, Russell tells us Sunday, is based on 'a reliable source close to [his] family.' Russell notes, however: 'The family is still saying that they don’t know [what happened], and that nobody has told them anything.'." Robert Russell has appealed for more information about Akran Raslan on the Facebook page of The Syrian Journalists Association. Massoud Akko is involved in the Syrian Journalists Association. He's a Kurdish journalist from Syria who went into exile in Norway in 2010. Akko says his sources in Syria have alerted him that Akram Raslan is dead, though no cause of death is given. "Raslan is in a prison run by Syria's security services, not a regular prison, so we can't confirm anything," Akko says.